Kilim Rugs are flat woven textiles. The term KILIM is used to describe a WEFT-FACED textile. Wefts are the yarns in a rug that span horizontally on the rug as opposed yarns which traverse vertically in a rug. Kilim Rugs are called weft-faced because you see all weft yarns. A Kilim is flat because there are no knots. It is reversible. Design and colors help to determine the country of origin. The Turkish, Persian, and Kurdish varieties of kilim are quite similar, with sweeping geometric shapes including triangles and zig-zags. 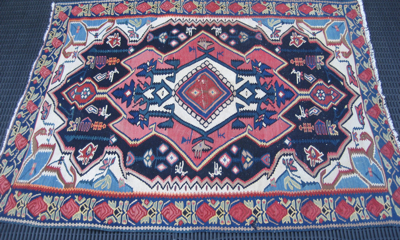 The Persian seems to have smaller designs as compared to the bold, larger images on the Turkish kilim.